Starting in Oslo, Norway, in March 2013, with a follow up in Nayarit, Mexico, in February 2014, a majority of states have jointly entered into a process that focuses on the humanitarian impacts of nuclear weapons. We don’t know yet exactly where this process will lead, but there is no doubt that the international community, with a vast majority of states, clearly declares that nuclear weapons are too dangerous and too harmful both for humans and the environment to be kept around in a state ready for use. We also know that the process—with a humanitarian focus—will continue to move forward when States and NGOs gather in Vienna in Austria later this year. 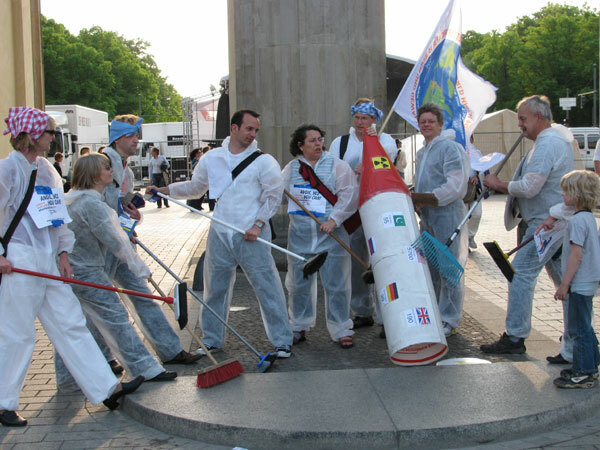 IPPNW Germany activists symbolically sweep nuclear weapons into the trash during a recent protest. There is, perhaps, no wonder that the small minority of States armed with nuclear weapons—and apparently addicted to them— have so far stayed away from the process. Nevertheless, they will have to come on board sooner or later, unless they have a desire to be left out altogether. They simply have no choice. Like smokers who have no real reason to continue smoking, the nuclear-armed states have no real reason whatsoever to cling to their completely useless, immoral, inhuman, and tremendously expensive nuclear weapons. Last weekend, I told my oldest grandson, who is 12, about the recent conference in Nayarit and the exciting results that came out of it. During our talk he asked me why somebody does not simply ask the few nuclear armed states why they claim to need their nuclear weapons and for what purpose. When we discussed this further, we could not think of any significant reason that they could come up with, only bad excuses, like deterrence, peacekeeping, and such meaningless and outdated rubbish. We agreed that his question is absolutely in place, and that the only real answer to it is total nuclear weapons abolition in our lifetime.